This area of residence is a Bedouin concentration near A’nata, situated in the southwest margins of the town, west of the E1 plan, near the course of the separation barrier planned to encircle the Ma’ale Adumim enclave. 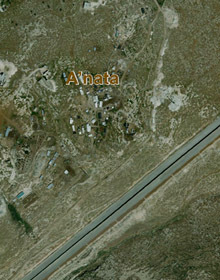 Residents arrived at the locality from the Tel Arad area, and settled in the A’nata and Shu’fat area at the end of the 1960s. Historical analysis reveals ongoing settlement at least since the beginning of the 1990s. The community is affiliated with those residing in Al-Khan Al-Ahmar. When they arrived there, they first settled on private lands owned by residents of A’nata, with the agreement of the landowners. Over the years, some of the Bedouin residents purchased the lands on which they were living. 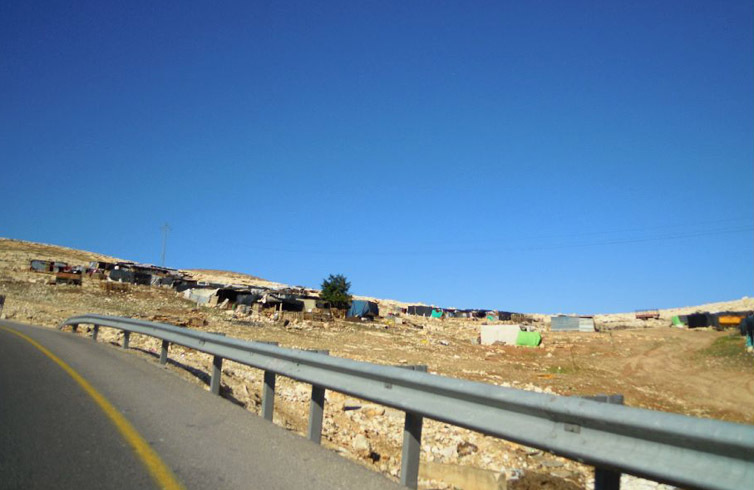 Today, some 10% of the land there is privately owned by Bedouin residents, but as the open space between A’nata and the course of the separation barrier – under a process of gradual construction – shrinks, leading to an growing lack of available lands, the tension between the Bedouin residents and the residents of A’nata who seek to push out the Bedouin, is increasing. Additionally, twenty Bedouin families have been trapped on the Palestinian side of the barrier, even though they possess Jerusalem identity cards. Most of the lands are still under private ownership, and are located outside of the jurisdictional realm of Ma’ale Adumim, and outside of the E1 plan boundaries, but some of the lands are registered state lands included within the plan limits. The settlement is located near the plan for the eastern Jerusalem loop highway, and a small part of it is located within the road plan. Since the late 1990s, demolition orders have been issued for buildings there, with intensification in recent years, and indeed, more than 20 homes have been demolished since 2000, mainly in recent years, as part of the construction of the separation barrier. Residents are in possession of large flocks that are kept most of the time in pens, since access to most of the grazing areas has been blocked, particularly since the separation barrier was established there. Residents cultivate, with the agreement of the land owners, agricultural plots where barley is grown for the flocks, but this does not compensate for the lack of grazing lands. The sheep serve for the manufacture of milk products for home consumption, bartering and marketing, mainly in Shu’fat and A’nata, ever since the road to Jerusalem was blocked, making it impossible for residents to pass. A minority of the men have in recent years worked outside of the locality, mainly in construction, in the nearby localities and settlements. The Italian NGO Vento di Terra supports the local non-profit “Badeiat Al-Quds,” which operates a project in the center of A’nata for encouraging the employment of Bedouin women in handicrafts and jewelry production. Access to the locality is available via A’nata, which is relatively convenient. Nearby public transportation is also available. School children, some 60 boys and girls, use public transportation.